In 2011, Tom Horn accurately predicted the 2012 resignation of Pope Benedict XVI, the 265th Pope. Pope Francis replaced him, taking office on March 13, 2013. Everyone agrees Pope Benedict XVI was the 111th Pope since Malachy’s prophecy. So, Pope Francis appears to be the 112th, the one who must fulfill the prophecy. However, Tom Horn believes Pope Francis is not the one. “I believe Pope Francis was not canonically elected. I believe some hanky-panky went on in the conclave. In fact, I think that has something to do with why he picked St. Francis of Assisi as his namesake. His real name is Bergoglio, as you know, because Francis of Assisi prophesied about the final Pope and he said he will not be canonically elected. Now that means that he’s a placeholder for reasons that we can’t quite figure out, but I believe he’s either going to be removed from office or he’s going to step down like Benedict did, soon. And the guy that comes up to take his place is actually going to be the real Pope 112 by election, Petrus Romanus. 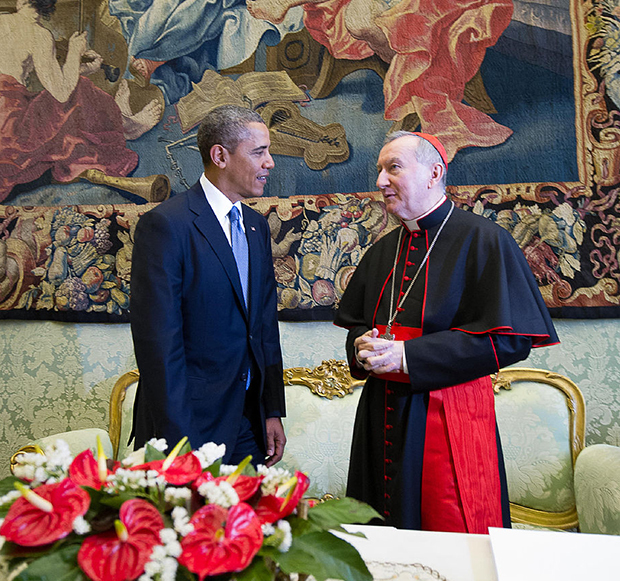 The Vatican’s current Secretary of State, commonly known as the Cardinal Secretary of State, is Pietro Parolin, shown in the photo above with President Obama. Parolin seems to be a better fit for the title of Peter the Roman than Pope Francis for several reasons. First, his real name is Pietro, which is Italian for Petrus (Latin) or Peter (English). I was unable to find the definition of Parolin. Second, unlike Pope Francis, who is a native of Argentina, Parolin is a native of Italy, which makes him a better fit to be called Peter the Roman. Third, Parolin is currently 62 years old, 18 years younger than Pope Francis which makes him more likely to live long enough to fulfill St. Malachy’s prophecy of being in office during the destruction of Rome. At age 80, it seems like a stretch for Pope Francis to live long enough to fulfill the prophecies. We can’t completely take into account Bro. Brian Carn’s prophecy because earlier he said a Woman will become the US President after Obama. So he may be wrong or got it wrong again. I dont know exactly but we have to pray a lot for the right discernment. Bro. Sadhu has a very strong prayer life and he prays like 6 – 8 hours daily and he has so many visitations and encounters unlike other prophets who dont even spend one hour in personal prayers. So we need to be very cautious and vigilant. Praying to our Lord for my own discernment daily. Mr. Horn,When are you people going to understand that Pope Francis is not named after St. Francis.Pope. Pope Francis is named after Sir Francis Bacon. Look at what Pope Francis says and does and you will see he is saying and doing the same thing Sir Francis Bacon said and did centuries ago. And ironically many believe that Shakespeare was really Sir Francis Bacon. This is just one link. The town’s patron saint is named Isadore, which means “Gift of Isis.” Isis with baby Horus on her lap was what Catholicism used as inspiration of statues of Mary holding the infant Jesus. In a recent conference, Bro. Sadhu Sundar Selvaraj makes the connection between the worship of a god named ashtaroth and Mary whom Catholics revere. No, I am not attacking Catholics as I was one for 25 years until I got saved. I ask those true believers of Jesus to wake up and not be deceived by anything contrary to God’s Holy Word. I pray daily that my own family wake up out of their religious slumber and find salvation before it is too late. Sometimes the truth can perhaps seem like attacking when it is not. My own writing a case in point. 50 years ago I moved to an intensely Catholic area. Got along well then and now. So I see/hear things. Finger on the pulse. Many are leaving, some mumbling about the day of going underground in home. One guy connected to church hierarchy and knowing a lot of archbishops due to his father’s career validated (with insider stories) how Pope JP I was murdered. Follow the money, BCCI, Vatican Bank, Alfo Moro. There are more and more thinkers in pews and on kneelers. St Peter did NOT roost in Rome. He went to Great Britain. When he went back to Rome to see PAUL is when he was murdered. I have a lot of Jewish friends and Bris is the Hebrew word for male circumcision and “Brit” for circumcision of the Heart. Great Britain? Tremendous revival first Century. Infuriated Rome… and away it went with Celts Druids, etc etc. There is a reason WHY the Vatican hides stuff away in the basement and the Smithsonian does, too! Great Britain no longer exists–it was replaced by the United Kingdom around the time of the War Between the States here in America. The Antiochians claim that St Peter never went to Rome but was martyred in Antioch. But whether Peter or Linus, the Popes of Rome, like those of Alexandria, and the Patriarchs of Antioch, were originally Orthodox. The Catholic Church came into being in AD 800. A mother with child is a universal thing. The Egyptians also believed that one of their gods, Osiris, died and resurrected. It does not take anything away from the real resurrection of Christ. The Zoroastrians believed in angels before they were described in the bible. Does not mean that angels are a pagan invention. The Babylonian Epic of Gilgamesh is an older text describing a universal flood put into writing way before the Genesis one was written. Because things are similar does not mean they are the same or that they have sinister origins. Early (Orthodox) Christians considered all these as prophesies of Christ, the Theotokos, etc. I personally believe there is more to this than meets the eye. Just like the identity of the antichrist cannot be discerned through pure research, I believe the same applies to the identity of the false prophet. Also, I think it is worthwhile to mention that there are two kingdoms at war. Change of battle plans; repositioning of troops and commanders; and the use of decoys, propaganda, and disinformation are all strategies that can be used against one’s enemy. While God has been gracious to us in declaring the end result of this war from the beginning, I believe the intricacies of his battle strategy including classified briefings of enemy plans and movements are reserved for those willing to become a part of his war council—that means remaining in close proximity to him and in constant communication with him. And it is only those who know his battle strategy who will understand his moves on the chess board, which may make no sense to a commoner on the sidelines. Is anyone else confused by this wording – “…Francis of Assisi prophesied about the final Pope and he said he will not be canonically elected.” If Saint Francis said “the final pope” will not be canonically elected, then why/how does this disqualify Pope Francis (presuming Tom is correct about his ascension to the papacy? Katherine, I had to really think to get your logic, but you make sense. If we take at face value that Tom Horn agrees that Francis of Assisi prophesied that the “final Pope” will not be canonically elected, and that Tom Horn believes that Pope Francis was not canonically elected, then Pope Francis IS the last pope, per Tom Horn’s logic. Tom Horn is an author, maybe with some inside knowledge, but is he a real prophet? Tom Horn is a brilliant man, and a true man of God. I don’t know that he’s ever claimed to be a prophet. He may be; in these past days ALL His disciples will all walk in the prophetic, whether as teachers, apostles, warriors in His army, or whatever……..man, woman and child, or all ages. I am not discrediting what Tom has said…I simply don’t understand what he apparently said. Perhaps he misspoke, was mis-quoted, or did not clearly state his position. I read all Tom’s stuff when Francis became the Pope and he clearly and repeatedly identified him as the”Petros Romanos,” the 112th pope. However the mental convolutions used never really made sense. It was a stretch at best .I suspect he now realizes that himself which is good to hear! I wondered about that too and we all saw the smoke come out the chimney, as sued to indicate a new pope had been elected by those who are in charge of that. he was canonically elected then! If not, then surely those whose position to do that would have spoken out. No one has ever protested that Francis was not properly elected. Not exactly protested, but I remember a few mans that claimed that the renounce of Benedict was not valid, because he committed an “error” in redacting the document . On the other hand, some people say Francis was the authentical pope elected in 2005, suceding JPll ..but in the conclave Francis pleased to be not elected, then Benedict XVI assumed .. So if we respect the prophecy of Malachy (I don’t believe in this prophecy) he doesn’t wanted to be elected pope (I am argentine and can confirm that this is true and happened) maybe he is the real 111th pope and not Benedict XVI (an impostor). He will be suffer anyway a health problem and will survive, standing there for a couple of years, then we will have the next pope (whatever if he will be Peter the Roman or not). Yes, except…I also remember Father Malachi Martin writing about the overt evil of the Second Conclave (or Second Vatican Council? ), and that Pope John Paul II was murdered in the Vatican, so I ascribe no veracity to anything associated with the Vatican. Frankenpope is an antipope. You can’t have 2 popes at the same time and Benedict is still alive, regardless of the “spin” put on it. There are rumors that Soros and the Clinton cartel had a hand in Benedict’s “resignation” and that Frankenpope is in bed with them. Current version of Operation Gladio. Satan was enthroned in the Vatican in 1963. The Church has been in apostasy since Vatican II. pastor Sadhu , Neville Johnson, Nita Johnson all said that pope francis is the false prophet. Terry Bennett, a proven man of God has also revealed that the Lord has shown him Pope Francis is the false prophet in a couple of messages. Sorry forgot to add it can be heard at the 1:49.15 mark! I was able to find another reference to Terry Bennett saying the Current Pope was the False Prophet. At the 16:35 mark, “The Thessalonian passage is extraordinary clear on this, they will believe a lie. That’s why The False Prophet, the Pope tells everybody what they want to hear. But his actions speak way louder than his words. Is that not true, and isn’t it the actions God says is the real fruit of things, not words. I saw that man in 2001 when Gabriel appeared to me for four days. I saw the present Pope. He showed him too me, as the False Prophet. You are not going to convince me he is a good guy. When I was shown in 2001 differently by Gabriel. Some say ‘well is he the False Prophet’? Whatever you want to argue about. If he’s not a false prophet, he’s at least that, a false prophet. I believe him to be The False Prophet. He will, and you will see it soon, he will introduce the world to the anti-christ. He will and this is not far in coming. We’re talking, we’re not talking about the next 20-30 years. No, no, no it’s way sooner than that, way sooner”. Delusion and un-locking the souls power is Satan’s end-time game. We will see miracles, real working miracles done from the unleashing of the soul. It’s power is real but from the wrong source. Brothers and sisters we must be on guard continuously against the enemies deceptiveness. Our hearts constantly have to be cleansed and repented of, or we will fall victim to deception. Great job Kristi. His description of “the present Pope” can only be Pope Francis. I am saving this for future reference and adding Terry Bennett to the list of those claiming he is the one. It is significant because if he’s right, the Lord’s return is soon because Pope Francis turns 81 in December. Thanks Kristi. James have a look at Pope Francis with different heads of states. The picture tell all. Thanks Joe. Great photos of two key culprits. TB also goes on to say that the Lord showed him the face of false prophet as Pope Francis, and also the face of beast and anti-christ whom we have NOT YET seen. This message is excellent and discusses the greater outpouring of deception with in the soul during these end times. He says that REAL miracles and healings will be performed by the FP and AC, and be from the wrong source. He speaks on guarding against deception and the unleashing of the souls power. This is an excellent message and I encourage all believes to listen to it in fullness. Thanks! To clarify, he did not mention Pope Francis. He said the Lord showed him the face of the Pope. I’ve heard in his other teachings he specifically said he was not shown his identify, just that he was the Pope. He said he is already here, so he might have been referring to Francis, but since he did not say specifically, I think it is best not to quote him as saying so. Regarding the antichrist, he did not say no one has yet seen his identity, just that he himself has not yet seen his identity. Since by his own admission the identity of the antichrist has not yet been revealed to him personally, he would have no way of knowing whether or not he is already here or not. He makes these comments at the 1:49 mark. Thanks Kristi, TB is very clear at 16.35 about the present Pope as the FP. James, I listened to the audio link and TB is very open in that statement about the present Pope as FP. Blessings! Thanks John, but James was referring to the first message I posted. Thanks for sharing that Kristi. Do you have a video link showing Terry Bennett saying that? I’ve heard him share how he saw the Pope, but have never heard him say it was Pope Francis. Sadhu sundar specifically quoted that the current pope is the false prophet. Wasn’t there a recent post by Sadhu Sundar Selvaraj saying that Pope Francis is the false prophet? Sujit, so it has been confirmed to you that the Vatican’s leader will be the false prophet and that they will side with the man of sin, who is the Antichrist. The Antichrist arises from this beast of Revelation 17 and is united to the Vatican and False Prophet. This beast has 7 heads and these are 7 hills or mountains on which the woman, Babylon the Great, The Mother of Harlots, sits upon (Revelation 17:9). So you see, the Vatican can’t be the woman, it is part of the beast. The beast has the 7 heads, not the Harlot. The ten horns of the beast hate the woman, eat her flesh, and burn her with fire (Revelation 17:16). The Vatican will not hate, eat, and burn itself. This woman, Babylon the Great, the Harlot, is something else. Thanks for sharing your thoughts. You have a point, and I certainly don’t know how everything fits together. From what I gather from that chapter, the woman in the vision was described to be a great city that had an empire over the kings of the earth. The woman was not only described to be seated on the beast but also on the seven heads of the beast and on many waters. There were two descriptions given for the seven heads—seven mountains and seven kings. The beast was described as an eighth king who was actually one of the seven. The many waters were described as peoples, multitudes, nations, and languages. So for a city to be seated on all three, could it mean that the city held sway or ruled over all these? As regards the Vatican hating, eating, and burning itself (of course, this is all still conjecture), perhaps because the false prophet is aligned more with the beast than with the Vatican that birthed him, after his rise to power, he comes into tacit agreement with the beast that the Vatican’s influence is no longer required? Perhaps the false prophet considers the Vatican to be no more than a ladder for his rise to power? Another way to look at this is that in Daniel’s vision of the fourth beast, a little horn came up among the ten horns of the beast and uprooted three existing horns. The little horn did this even though the three existing horns were a part of the beast. So perhaps backstabbing and eliminating those in the kingdom once they are no longer required or useful to the kingdom’s cause is the reason why a city or entity considered to be a part of the beast is destroyed by another part of the beast? Re “remaining pope to fulfill the role”.. I believe the same will happen with PM Netanyhu. It was prophesied to him that he would see the 3rd temple rebuilt. True, but doesn’t mean he will be PM at that time, just that he will live to see it rebuilt. While on some regards all that seem plausible, I still can’t see how the A/C would choose a Pope who is so adamantly Pro Life and clearly does not support gay marriage! A kingdom divided….. and so on. Tom Horn owes an apology to those who follow his work. He has said for years now that Pope Francis is the final pope, Petrus Romanus. He’s the final FALSE POPE. One of my post is missing which I posted few minutes back. I was saying that the Lord Jesus came personally and spoke to Bro. Sadhu about the present Pope and told Bro. Sadhu that the present Pope is the False Prophet according to Revelation chapter 13. St. Malachy also says in his propehcy that the last Pope will lead the Catholic Church during Tribulation which means the last Pope may be a good pope and lead his sheep during this time of trial and tribulation. I believe the present Pope is the False Prophet strongly and he would soon give up his position or removed from his position and he will promote the Antichrist and pave the wave for one world religion and join hands with the Antichrist. Many weak Christians and Catholics in faith will fall into this trap and pay their allegiance to the False Prophet and Antichrist during this period of time. The bride will be slim by the time her gown gets on. He that has ears to hear,let him hear……..
You are absolutely right! We need to pray a lot and fast even often to know the plans and secret counsels of God. He will let us know either directly or through Visions / Dreams. If God is in mercy would speak directly through encounters or visitations than dreams or visions. But my whole life God has been speaking concerning so many things mostly in Dreams or Visions. I still prefer a face to face conversation with our Lord, praying about it. We all need to go to that level in our walk with God like the OT/NT saints who had face to face encounters. If our earthly fathers would love to talk to their children daily and in close proximity and fellowship, why not our heavenly Father? He loves to speak to us and wants that intimate fellowship with us daily even showing Himself to us in a tangible way. I strongly believe that the present Pope is the False Prophet, because I can very much trust Bro. Sadhu on this more than all the these dreams and visions from other sources. Sadhu says Lord Jesus himself appeared to him in 2015 and told him that Pope Francis is the False Prophet according Revelation 13 chapter. The next Pope may be leading the True Catholic during the Triulation period and will be against Antichrist and the False Prophet as per St. Malachy The Antichrist will not get the support of the new pope but the existing Pope Francis. Pope Francis then may have resigned or removed from the Vatican and he will forge an alliance with the Antichrist and many weak Catholics in faith and many weak Christians in faith will completely surrender their allegiance to the fallen Pope(False Prophet) and ANTICHRIST without even knowing what they are doing. It will be very subtle and deceiving. Keep in mind that this pope is 80 years old, close to 81 now. This man is not very popular either. Maybe Sadhu saw a future pope, but was confused by this one. Italian popes look the same to me as well. In my spirit I believe more what Pastor Benjamin Faircloth prophesied.